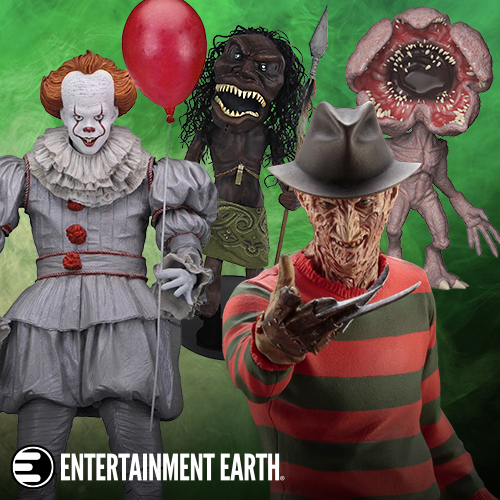 After battling and killing a large possessed plushy dinosaur, the Winchesters, Sam and Dean (Jared Padalecki, Jensen Ackles), are rewarded by the store owner with whatever they wish to take home. Sam isn't interested in a reward. But, Dean happily accepts and decides on a large, HD TV set. When, they turn it on, they are sucked into a cartoon world, which ends up being the Scooby-Doo show! Sam wants to find a way out, but Dean wishes to stick around. He is, after all, a Scooby-Doo fan and wants to hook-up with Daphne, of course! They soon figure they probably need to ride it out to figure out just what is going, anyway. It turns out a dead man that Scooby once saved has left an inheritance to whoever survives the night at a haunted and spooky, old house. Dean immediately recognizes the episode and is excited about it all. But, then one of the people up for the inheritance ends up dead, with a knife stuck in his back. The Winchesters soon realize that rules for this Scooby episode have changed as one can die for real and the evil ghost haunting the house is very real and not some dude in a mask. The hype and excitement surrounding this episode has been high since it was first announced. 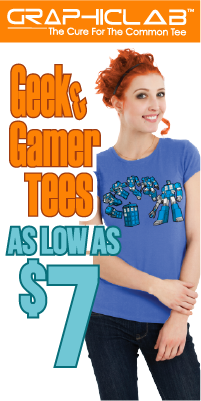 Practically every geek and horror site had been mentioning the coming of it much in advance. The result was a ratings success for the CW scoring the show's biggest rating since the season 13 premiere. With a rating of 0.7 in adult viewers 18-49 and a total of 9 million viewers, it is clear that the hype paid off. And, the best part is that the episode more than lived up the hype! From the very start the tone, of this installment, in particular, is set. It is utterly hilarious with a clear sense of fun. And, once it goes into cartoon mode it fires on all cylinders! The animation is, of course, wonderful. 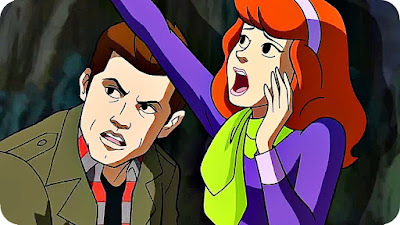 Catching the look and feel of a Scooby-Doo episode, but with stronger, modern animation. It manages to meld both the Supernatural and Scooby-Doo worlds perfectly and with great loving care for the later. There are so many bits and moments to savor. I love that Dean not only hates Fred, but that he is all about Daphne. I mean, what kid didn't crush on her? On the cartoon spectrum it is awesome that Velma has a thing for "broad shoulders" and, in turn, Sam! It is a fun dynamic that adds up to some great laughs. 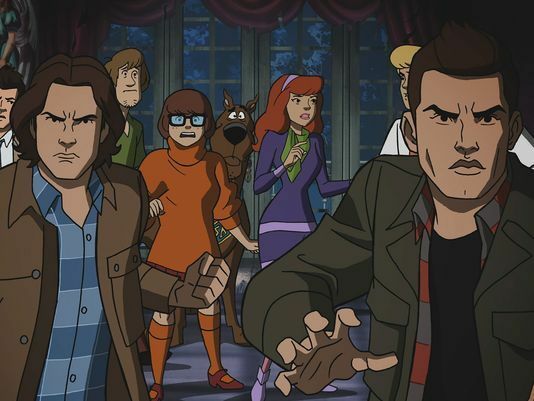 And, who amongst isn't going to love Castiel, the angel, hanging out and protecting a hippie dude and his talking dog (IE Shaggy and Scooby)!? Still, this is a horror series, and as such, the suspense, once it starts to come into play, is very present and extremely well handled. That people die and die violently in Scooby's cartoon world is quite eye opening. This marks the first time that there is any blood and gore, much less a lopped off head in a Scooby cartoon. Or, for that matter, cursing, as Dean drops a couple of choice words, including a bleeped out f-bomb, which, come to think of it, is a first for Supernatural, too! The Supernatural guys explain that ghost, demons, vampires, etc are real to the Scooby gang, and they are in fact dealing with a real ghost. They team up to stop the spirit, using one of Fred's doomed to fail elaborate traps. But, Dean and the guys do ultimately capture the spirit. And, we learn that he is, in fact, a child ghost tied to a pocket knife that the evil real estate agent was using in the real world. This was his way of cursing the store owner's product so that he would be forced to close up shop. But, our ghost didn't want to be bad. As such, I love that Dean ask him for a favor, as they will help him be free in the real world, afterwards. The Supernatural crew decide to tell the Scooby gang that it was indeed a man in mask and not a real ghost. And, pull off the mask, and they see that it was the real estate agent that read the will, earlier. Of course, this was the form that they asked the kid ghost to take, as there is no reason that the Scooby gang should live with the knowledge that supernatural evil exists in real life. The Supernatural guys return to the real world, where they burn the pocket knife, setting the kid ghost free. Then, they go back to store, just as the owner was just about to turn to deed of the store over to our main villain, the real world real estate agent. This is a great throwback to the classic Scooby trope. He even says the classic "I would have gotten away with it, if not for these damn meddling kids!" (nevermind that Sam and Dean haven't been kids in years...), as the cops take him away. Also great is Dean wearing an ascot, much like Fred. This symbolizes that his hate for Fred is over. It all ends with some pathos for a nice final touch. Scoobynatural is not just the finest episode this season of Supernatural, it is one of the show's best episodes ever! It perfectly combines the best elements of both shows. 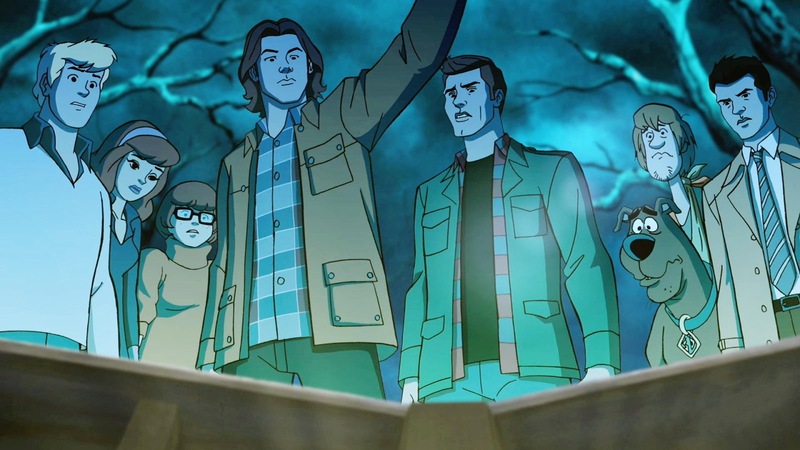 And, it manages to show much love and reverence to Scooby-Doo, while adding the edge and horror of Supernatural. A must see for fans, this one will surely go down in genre TV history!